Diamond Halo Pendant for Round Gemstone (18 in) | Shane Co.
Twenty brilliant round pavé-set diamonds, at approximately .14 carat total weight, serve as the perfect backdrop to the center gemstone of your choice at approximately .50 carat in this dazzling halo pendant with milgrain detailing. 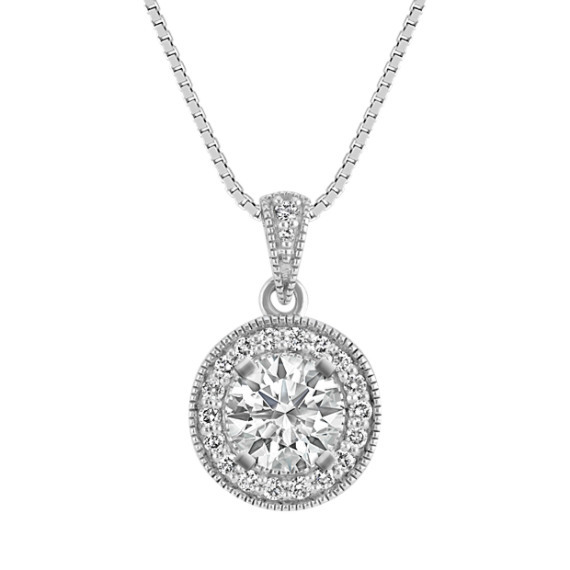 The 14 karat white gold design hangs from an 18-inch matching box chain and measures 5/8 of an inch long. For more information on selecting your center stone, Live Chat or call an online customer service representative at 1-866-467-4263, or visit one of our store locations.